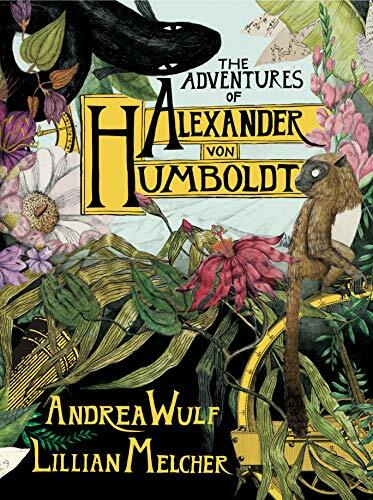 There could not be a better subject for a work of graphic nonfiction (to use the author’s term) than the great Prussian naturalist Alexander von Humboldt. Humboldt was a man who never stopped traveling, measuring, and writing—and, while he was traveling and measuring and writing, also talking at a breakneck pace, sometimes in five or six languages at once. He befriended and corresponded with everyone of any significance on several continents, including Schiller, Goethe, Cuvier, Humphry Davy, Simon Bolívar, and Jefferson. He was noted for looking and acting decades younger than his age, well into his sixties. And he was still throwing off thousands of letters and huge elaborate manuscripts—and attending other professors’ lectures, in order to take notes and cram his insatiable mind with more—in his late eighties. The Invention of Nature, Andrea Wulf’s award-winning thriller about this great forgotten genius, tells the whole story, and now it gets the graphic novel treatment in collaboration with first-time illustrator Lillian Melcher. Wisely, Wulf, and Melcher focus here almost exclusively on the exotic yarn of his great five-year South American adventure, which began in 1799. It’s the easiest part of his life to tell in a single narrative, the most colorful, and one of the best parts of the original book. And Wulf switches to first person, so that we can hear the man in his own breakneck, fact-filled, but often poetically eloquent voice. Here then the naturalist retells his own greatest adventure from the viewpoint of energetic old age. Set pieces include storms at sea, encounters with a river full of electric eels, and of course his stay in Quito and his obsession with volcanoes. He summited many reports, including Pichincha and Cotopaxi, always with multiple scientific instruments and always stopping to make every conceivable type of measurement. Even the South American journey isn’t easy to fit into one book, or easy for the reader to digest. And, out of understandable concern that we not miss the big picture, Wulf crams in a lot of asides, flashbacks, and flash-forwards, which echo Humboldt’s own style and voice, but in this format can interfere with the reader’s ability to keep track. The sense of disorientation isn’t helped by a decision of which the explorer would surely have disapproved: there are many place names, but, strangely in a book about an expedition, no maps. The colorful set pieces of jungle flora and fauna are gorgeous. Illustrations of instruments, documents, and the landscapes they attempted to capture often work well too, and there are several beautifully simple bird’s-eye views. But Melcher seems less comfortable with the faces of Humboldt, his companion Bonpland, the native people they encountered, and others; the expressions have a formulaic quality that fails to capture much emotion. As a result, despite a nuanced portrait of Humboldt that shows us his charm along with his obsessiveness and arrogance, as some level it’s as if we never really get to know him. One of many pleasures in reading about Humboldt, here as in Wulf’s original book, is that you can just see and hear his huge influence on Darwin. The great sage of Down House admitted that he would never have chosen to get on board the Beagle except under the Prussian writer’s influence. The influence never let up, either: decades later, a Humboldtian way of thinking about nature’s interconnections, in boldly new ecological terms, informs the main argument of the Origin. Humboldt was the earlier “millionaire in little facts,” and he was the earlier advocate of writing up those facts with a passionate, ardent, romantic delight. It’s a delight for us to have this opportunity to be reacquainted with him. And yet it’s such an impossible life to capture— nd this dense, ambitious book ends with Humboldt back in his study, admitting that he hasn’t had the space to tell even the entire South American story.